Click here to see incredible skies from all over our planet...as always, special thanks goes out to the Skywatch team for hosting each week...Happy sky watching weekend all! Ah, beautiful pink clouds and the moon as well! Happy SWF! 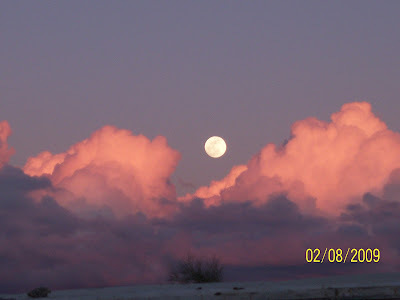 I love the moon held gently by the pink clouds!! I almost want to swear that is exceptionally stunning. Great shots, lovely colours of the sky and clouds! What a lovely shot, I love the colors and the gorgeous moon. Thanks for sharing. Happy Skywatching! I thought my eye caught a glimps of the moon, and I wa right.